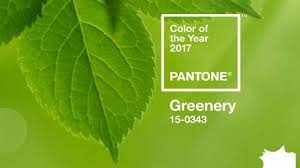 If you cook, garden or decorate, you’ll be happy to know that the Pantone Color Institute has announced “Greenery” as the 2017 Color of the Year. Not your everyday, plain ole green, mind you, but Greenery to capture nature’s inspiration and how it signifies healthier foods, the great outdoors and “go-green” environmental concepts especially. Before we go too far, you should know that Pantone System was created in the fifties to standardize color reproduction in the printing world. Then the Pantone Color Institute came along and decided to brighten things up a bit. It rolled out a color of the year that that quickly became the bellwether for design, fashion and myriad trends – and yes, that includes landscaping. Now that we’ve translated Pantone’s colors into plant choices for you, it’s your turn. Visit your local nursery, or better yet, contact a professional landscape design company. After all, who doesn’t need to revitalize and renew? Just walking outside to view your Southwest Florida landscape can reinvigorate your creativity and sense of awe. One company we KNOW will provide you with outstanding recommendations is ArtisTree Landscape Maintenance & Design. You can reach us at artistree.com or 941.488.8897 to set an appointment — we serve Sarasota, Manatee and Charlotte counties. Now get growing! I’m writing to tell you how pleased we are with the installation of new landscape material, commensurate irrigation and lighting equipment at the front of our home. When I say pleased I mean not only the end result but the outstanding personal service we received from every single ArtisTree employee from the design phase through installation; the quality was impressive."